Top; Explore TCM is introduced to Chinese university students. Bottom left; Professor Peng presents the project at a seminar. Bottom right; XResearch’s official logo. Passionate citizens help medical researchers create exciting breakthroughs in XResearch’s inaugural project. BOSTON, MA, USA, December 21, 2018 /EINPresswire.com/ — In January 2018 Explore TCM, a research initiative examining Traditional Chinese Medicine (TCM) principles whilst searching for new health metrics, was officially launched across mainland China. This month sees the first round of participants successfully complete the study. On signing up to Explore TCM participants received two wearables; an X1 heart rate monitor and a Huawei wristband. These wearables, accompanied with an app, provided participants with personalized physiological insights through the latest health analysis technology. Across the 9 month study period, every 2 weeks Explore TCM released a new mission for participants to complete. Each mission generated unique physiological data that XResearch’s team of international scientists then analyzed in the hope of both gaining deeper insight into some of the principles of TCM and discovering new metrics to quantify health. Explore TCM is a key focus of XResearch, a nonprofit organization founded in 2016 comprised of forward-thinking scientists, technologists, and passionate citizens dedicated to furthering health research. It is led by Harvard University’s Center for Dynamical Biomarkers who were finalists in the 2017 Tricorder XPRIZE global competition. XResearch’s core board includes Boston University’s Professor H. Eugene Stanley, Massachusetts Institute of Technology’s Professor Roger Mark, and Harvard Medical School’s Dr. Andrew Ahn and Professor Chung-Kang Peng. XResearch puts a particular emphasis on Citizen Science, the practice of public participation and collaboration in scientific research. Explore TCM clearly illustrated this by connecting researchers and participants through crowdsourcing and by providing an avenue for everyday people to donate their physiological data to help the research. 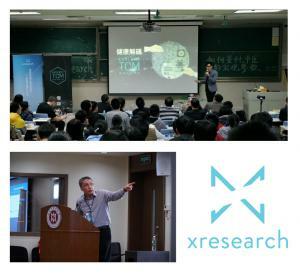 XResearch hopes to have a follow-up project to Explore TCM in action soon. About XResearch: Led by Harvard Medical School’s Center for Dynamical Biomarkers, the non-profit XResearch Coalition is a collection of forward-thinking scientists, technologists, and passionate citizens dedicated to furthering health and medical research through large-scale innovative projects. In the spirit of Citizen Science, the practice of public participation and collaboration in scientific research, they look to empower everyday people to contribute in moving health science forward. About Kiipo: Based in Taipei, Kiipo is a health-technology company that is founded on the principle that everyone has a fundamental right to a healthy life. They bridge the gap between cutting-edge medical breakthroughs and people, striving to make the most advanced health technology available to everyone in the world. Their current ecosystem of services includes projects to increase access to emergency care, tools to increase the quality of care, and research and development initiatives to facilitate scientific breakthroughs.